As the new school year gets into full swing, here are three back-to-school ideas for using Rocket Spelling to maximize your students' spelling progress. Rocket Spelling is designed to gamify your students' spelling practice. Start the year by encouraging your students to have a growth mindset when it comes to spelling. Even if certain words are difficult for them to spell as of now, it's important that your students understand that spelling -- like most things -- gets easier with practice! To explicitly see their own growth, we encourage your students to set both short-term and long-term spelling improvement goals. 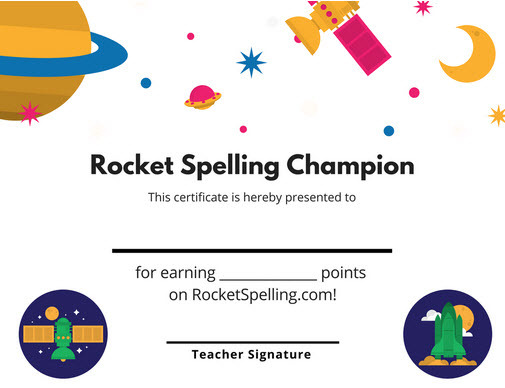 The certificates tab in your teacher account contains 12 different certificates you can use when students reach a certain number of points or beat an entire planet in Rocket Spelling. If you help your students to set concrete goals -- beating all of planet 1 or earning 200,000+ points, for example -- you can use these certificates to honor your students when those milestones are achieved! Here at Rocket Spelling, we believe the ultimate test of a student's spelling ability is how they carry over their spelling improvement into their everyday written work. The practice your students do on Rocket Spelling can fuel their confidence, helping them to see themselves as capable authors!